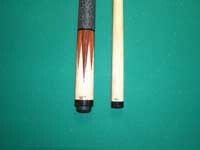 Cues listed below are currently available for sale. I do my best to describe each cue in terms that will be understood, however, a phone call or e-mail will always provide additional information and clarity. 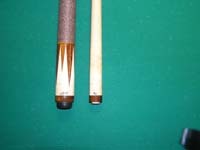 The number acccompanying each cue signifies the exact number of completion. Purchases can be consummated in the store through Paypal. 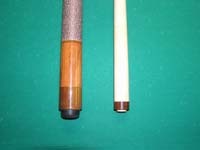 To search for a particular cue in the store type HittcueXX. My Paypal e-mail address is thebruce@colla.com. We are always working on orders and what we call speculative cues. I don't try to feature these in the website as they change rapidly. We build about 15 cues a month. If you don't see anything you like, check back in a couple of weeks. Much of my business is done this way. I am always happy to discuss design...simply call and ask for Andy or Brad to get the ball rolling. Currently, custom orders require no less than 60 days for completion. I work very hard to satisfy all of my players (customers). 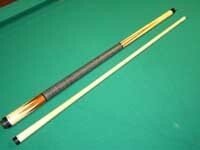 I will accept any cue returned (in original condiiton) in the first 3 days, for any reason. 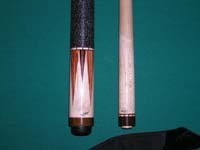 I only ask that you call or e-mail me before you return the cue and pay the shipping/insurance charges. 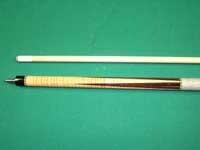 I don't want you stuck with a cue you don't like. 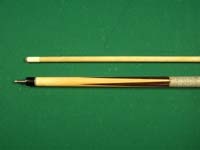 Please don't abuse this priviledge...if you plan to return the cue, take care of it while it is in your possession, send it back in the same (or similar) shipping container with the same (or similar) packing to protect it. 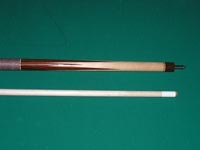 Insure the cue for the purchase price...if an uninsured cue is damaged...you are responsible. 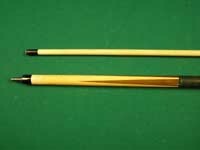 There will be no excuse for cues returned damaged. 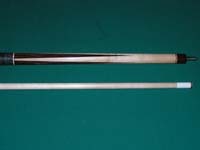 Cues damaged in shipping must be noted at the time of delivery with the shipper. Consequently, you must take a close look at the container BEFORE you sign for it.